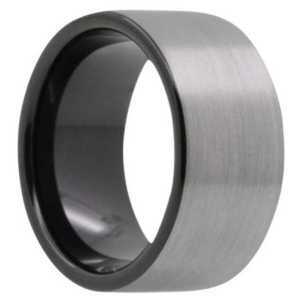 Tungsten rings are made by combining the metal Tungsten with Carbon, toform an alloy called Tungsten Carbide. The alloy is extremely hard due to its high density and has a melting point of 6,100 degree Fahrenheit, the highest among all metals. 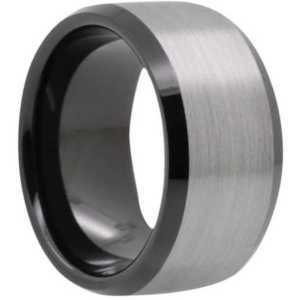 A hardness of over 9 on the Mohs scale make Tungsten Carbide four times as hard as Titanium and twice as hard as steel. The periodic table shows further information for anyone wanting to learn more. Widely used in industrial grade equipment, the alloy almost never gets scratched, retaining its shine and smooth finish for a very long time, making it ideal for wedding rings that last a life-time. Some Tungsten rings are a combination of Tungsten and Titanium, which further enhances their long lasting characteristics and reduces their weight by about 20 per cent. These rings are then polished under diamond wheels to give them a luster which will last practically forever, making the ring look like it’s always new.Such type of an alloy is often also called Dura Tungsten. 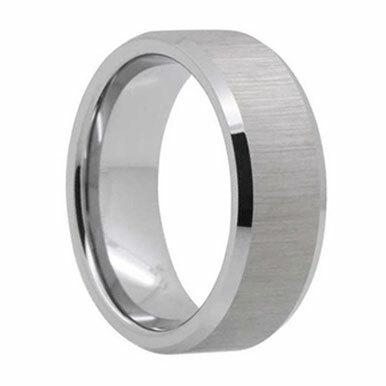 Tungsten Carbide rings are naturally grey in color. However, they can be given a high grade color through the process of physical vapor deposition or PVD. This gives the ring a permanent luxurious deep black color which resembles the color of an onyx. The PVD process also gives the ring better resistance to wear and tear by reducing the friction on the surface. 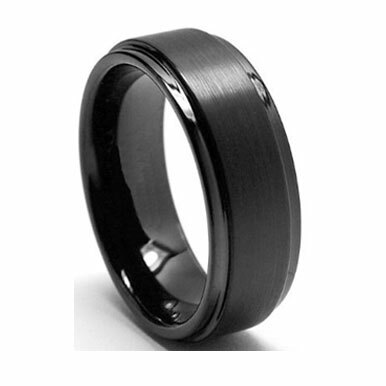 Black Tungsten rings are in high demand by consumers of both sexes and make for a highly attractive ring which looks like new even after considerable usage. A new type of binding process on the exterior surface of Tungsten rings can change the grey color to a rich white color. The glossy color looks similar to that of Platinum and, just like PVD, improves the resistant to wear properties. Though the white Tungsten bands are less prone to scratching than any other metal, the natural grey of Tungsten is proves to be even better. 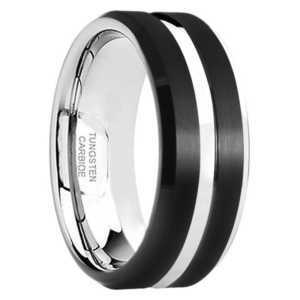 Tungsten Carbide wedding rings can be combined with other metals like gold or with carbon fiber in black or blue colors to create fancy designs.This is why it has become a popular choice in bridal jewelry. Even years after your wedding, the bands will not scratch and shine like new. Loosely translated in Swedish or Danish, Tungsten means ‘Heavy Stone’. The Swedish people also call it Wolfram as it was first mentioned by Peter Woulfe. Although knowledge about the naturally occuring element was present since the late eighteenth century, it was only during the twentieth century that we really began to realize the several potential uses of Tungsten. 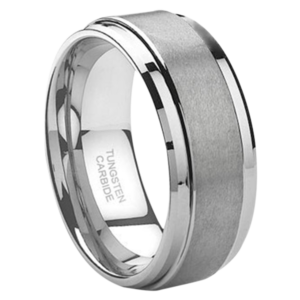 The best Tungsten Carbide jewelry is made using Nickel as a binder. While some people may be vary of nickel due to allergies caused by it when used in gold alloys, it is not really a concern when used with Tungsten. Tungsten alloys use Nickel only in minute quantities and bind it together very closely with other atoms, thereby reducing the risk of allergies. 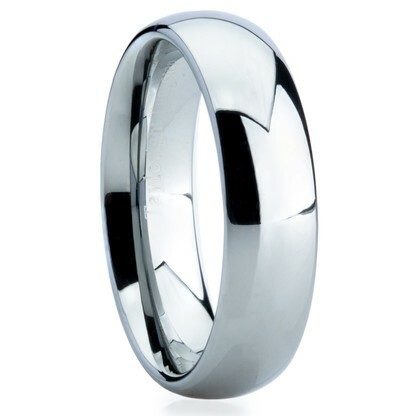 However, one should keep in mind that the higher grade Tungsten rings have lower quantities of Nickel than low grade Tungsten rings which use it a little more freely. There are chances that sometimes you may notice a more sticky stain on the ring which refuses to wash out even after repeated cleaning. It is advisable to contact your jeweler and ask for tips rather than resorting to more drastic measures like using a solution which may damage the ring’s polish. In most cases this stain, which can look like a scratch, is just a layer of some oxidized metal which came in contact with the ring. While each person’s ring should be a statement of their individuality, let’s not forget what they rings actually signify – the eternal union of two people. Hence, the bride and groom’s rings should go well together. While they do not need to be exact replicas or necessarily be purchased together as a set, they should at least have a few characteristics in common and bear some resemblance to one another. Characteristics which can be considered for a good match are the choice of metal, color of the band, intricacy, studded gemstone, width, engraving etc.